There are different reasons that people use VPN. Some of them need to change their IP addresses to access geographical blocked websites or online games; others want to have a secured VPN tunnel when they send important private data. No matter what is your reason of using VPN, you can have a better experience with appropriate type of VPN server. VPN Client app provides two types of VPN servers: shared VPN servers and personal VPN servers. Read this article to learn the benefits of each server mode and determine what kind of subscription plan exactly meets your needs and preferences. Your computer and a remote VPN server connect with each other over the Internet. All traffic between you and the VPN server is encrypted. The VPN server sends/forwards your communication to the destination. Your IP is hidden. Instead, the IP address of the VPN server is displayed. What are the possibilities with macOS VPN Client? Full protection of your personal data, blocking access to it for outside parties and scammers. Hiding your current location with assurance of absolute anonymity. Visiting foreign and forbidden websites to which you have limited access or are completely closed due to government censorship policy. Unlocking your personal accounts in social networks, forums. We have listed the most common VPN benefits. However, we are sure during VPN use you will find dozens more advantages. VPN Client is an excellent tool for securing web traffic and protecting personal data on the Internet. It makes web surfing secure and private. The only disadvantage of using VPN is that even the best services almost always slow down the speed of the Internet connection. This is because additional network nodes are added to the process of data transfer via the Internet. Without VPN, the web browser normally sends a request through the local network to the public Internet, and the web server displays the requested information. When the virtual private network is activated, the web traffic is routed through an encrypted tunnel. It travels through this secret tunnel to a VPN server, exits the encrypted private tunnel, and enters the public Internet. These additional steps degrade the Internet connection speed, just because more wires and computers are included in the process, and the distance increases. But don’t get upset. The difference is minor, and it’s not a case of having to choose between convenience and security. However, if you are a gamer and every millisecond counts, we recommend you use Personal VPN Server that provides the highest possible speed with additional benefits. A stunning speed. Personal VPN servers compared with shared servers can brag much higher speed. The VPN server belongs solely to you, and the server traffic is not shared with other VPN users. Use it as you wish! It’s an incredible offer for gamers. A personal permanent IP address. You get a dedicated static IP, so even when you travel, you can access your favorite websites, social networks and mail accounts without being disturbed by authentication errors and requests for confirmation that it’s you. A clean IP that does not have a suspicious history and does not cause distrust of websites. No traffic is being shared with other VPN users, so no worries about the server load time and speed limit. A higher secured protection of your privacy, online activity and shared data. Personal VPN Server gives hackers no chances. Whether you use a personal VPN server or shared ones, VPN Client app allows you to secure all your Internet activity. You can change your IP address and virtual location, hide your web surfing history, encrypt any information sent via the Internet connection, prevent your data from being hacked, unblock geo-restricted sites, access your favorite world wide web resources, and find many more benefits. 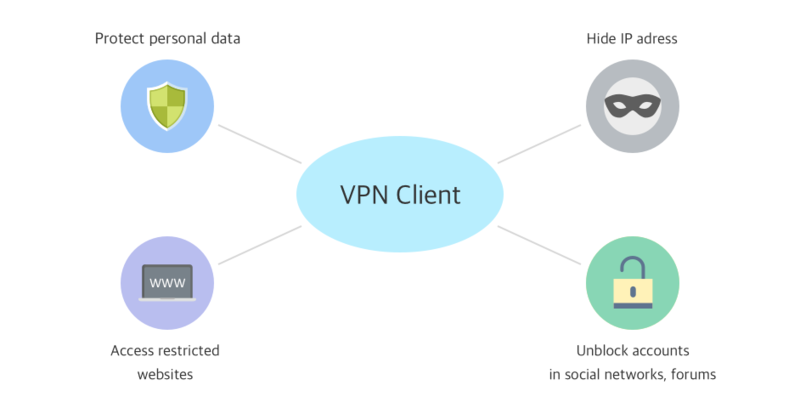 You should use Personal VPN server if you need a lightning VPN connection speed, if you want to have a static IP address with a clean history, or if a VPN security of your privacy is extremely important to you. In this case, we can guarantee you an uninterrupted VPN connection with the fastest speed. If the VPN speed level is not critical for you, we recommend you use shared VPN servers. Read also about VPN Client usage best practice recommendations.